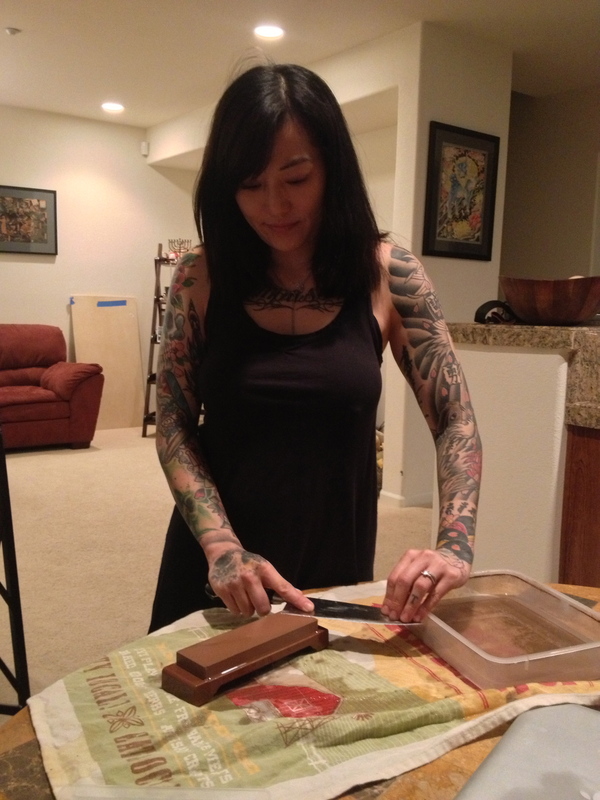 What would knivesandneedlesblog be without a blog on knife care? Anyone who cooks knows how important it is to have a clean, sharp knife. I personally think the better you treat your knife, the better the knife will treat you. And that can mean the difference between ending your night cozy in your house or in pain in the emergency room. So save those fingers! Ironically enough, most people cut themselves with dull knives that get overworked and end up slipping on food you’re cutting that rather than sharp knives that just get the job done with little or no effort on your part. Let the knife do the work! 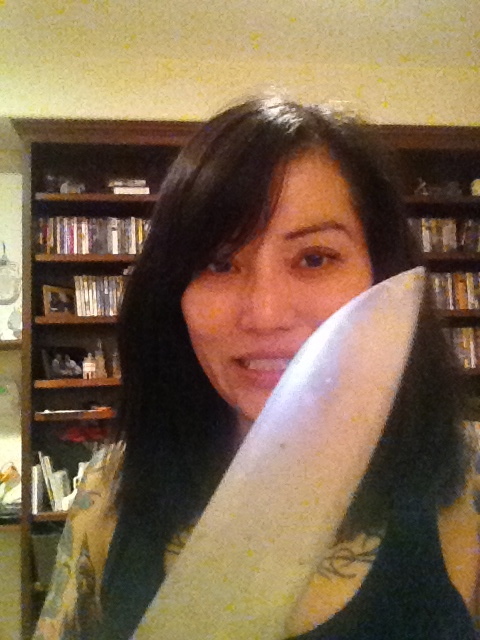 I love knives and I especially love a good multi-purpose knife that I can use for almost anything. In my opinion, all you need at home is a small pairing knife for the little projects like tourney-ing potatoes or peeling apples. But for most other daily culinary tasks a good, well-balanced chef’s knife is all you really need. I personally like Japanese-styled chef’s knives. With European-styled knives, the blunt end of the blade is just that, blunt and unusable. With Japanese chef’s knives, the blunt end is just as sharp as the tip of the knife, which makes the whole length of the knife blade practical. For example, the bunt end of a Japanese chef’s knife is great for taking pits out of fruits like avocado! Another aspect in choosing the right knife is price point. Japanese knives do not come cheap. They can run into the thousands. That might seem crazy to you, but for all you tattooers out there, knives are our tattoo machines! You can find cheaper knives almost everywhere, quality is nice, but just keeping your knife sharp is more important. Especially if you are just cooking at home. 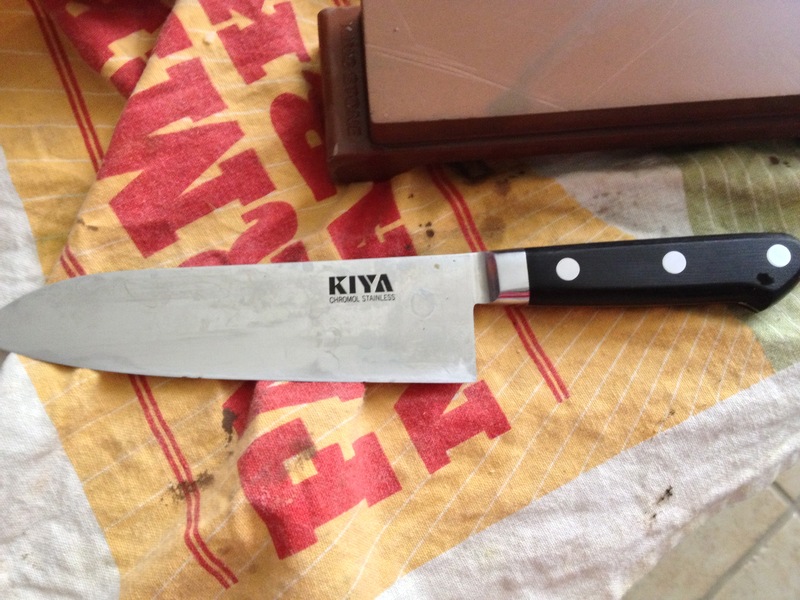 The knife I am using right now is called Kiya. It is a Japanese brand that may be hard to find outside of Japan, so look for it on the internet. 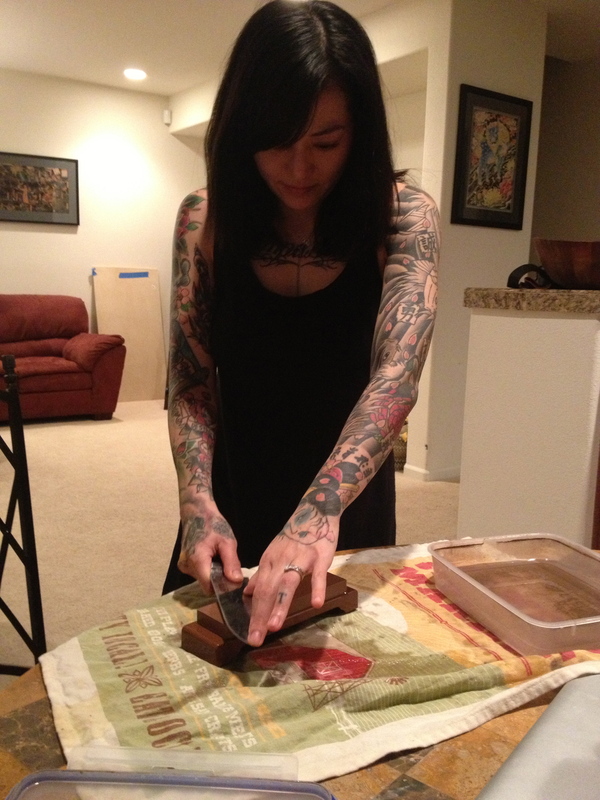 I like sharpening stones. Electric sharpeners are expensive, and the ones you drag your knife through never work well for me. So I will be talking stones only today. 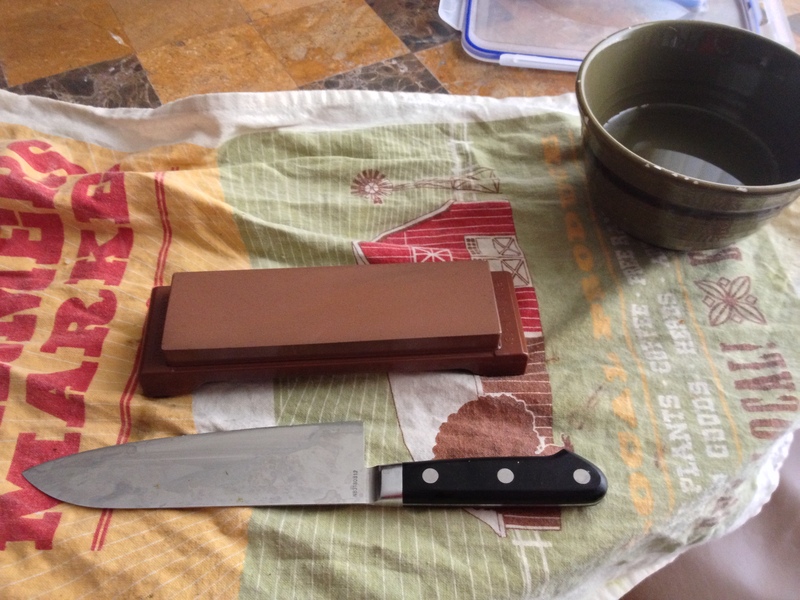 The sharpening stone is very important. You want to have the right grade for what you are trying to accomplish and also for the type of metal/knife you have. There are four main types of stones: natural stones, artificial stones, Japanese wet stones, and diamond plate stones. They can either be used as whetstones or oilstones. Natural stones are pretty rare these days, the only known mine open for mining the good-quality stone is in Belgium I heard. Synthetic stones are generally equal quality to natural stones however, so do not fret- your knife will be fine! 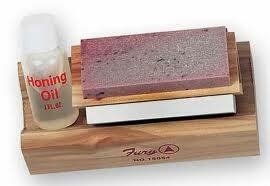 Whetstones do not need oil or water to lubricate for sharpening but they are often used regardless. Oilstones should be used with oil (if you start using oil, do not switch to water with the same stone later) and oilstones are usually of finer grit. The coarser the grit, the more metal you will wear away from your knife but it is needed to get a really nice edge. Fine grits are usually used to just polish your knife at the end. I will elaborate later. Japanese water stones are what I use. They are easy to store and I think oilstones are messy and are not good for the type of knives I use for work and at home. The only disadvantage to this stone is that it ‘wears away’ faster and you need to even out the stone from time-to-time. I usually wear it down on a piece of concrete until it is level again. And of course I wash it afterwards! 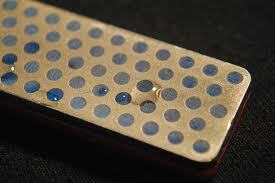 The fourth type of stone is the diamond plate stone. These tend to be more expensive as real diamond grit is used to make these stones but they are inferior in refining the edge of your knife compared to the other stones. Stone grading is important. The rougher the grit, the duller your knife should be. To make it easy, I recommend three stones for your at-home sharpening. One medium grit stone, around grade 800, for getting that edge back or getting out any chips in the blade; and finer grit to really fine-tune your edge, around grade 1,000-2,000. If you want to polish your knife, anything grade 8,000 and up will do you right. If you cannot get all three stones, just get a two-sided stone with the grade 1,000 and 1,200. 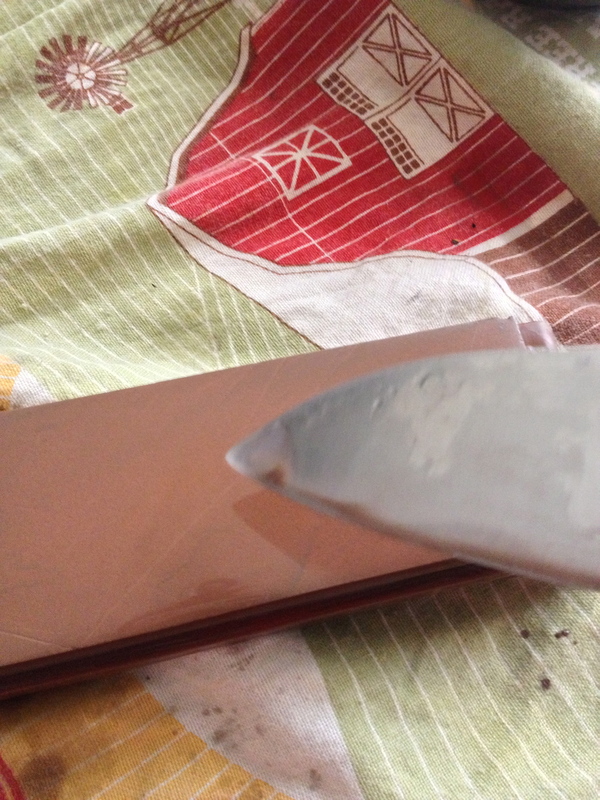 That is sort of an in between grit that will get your edge back and will refine the edge to a satisfactory sharpness. Also, you want to hone your knife after every use (it’s the stick sharpener that usually comes with a knife set). It cannot replace a stone, but it will keep your knife-edge aligned in between sharpenings. 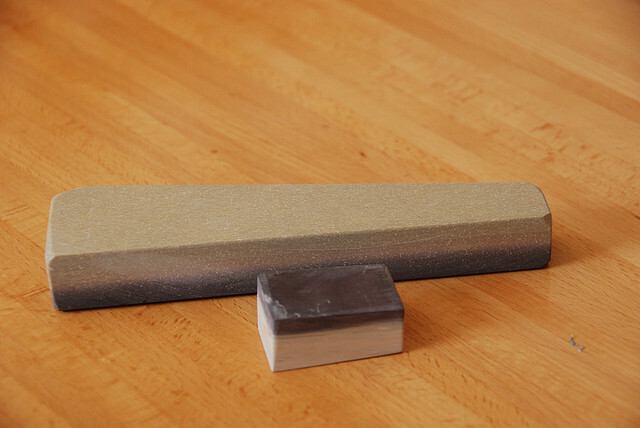 If using a Japanese water stone, wet stone by leaving it submerged in water for about 15-20 minutes before using. Set up your sharpening area by laying a kitchen towel down flat on a flat surface so the stone doesn’t slide around. Place the stone on the towel and have a bowl of water on-hand. Take the knife you want to sharpen in your right hand if you are right-handed (left if your not of course!) 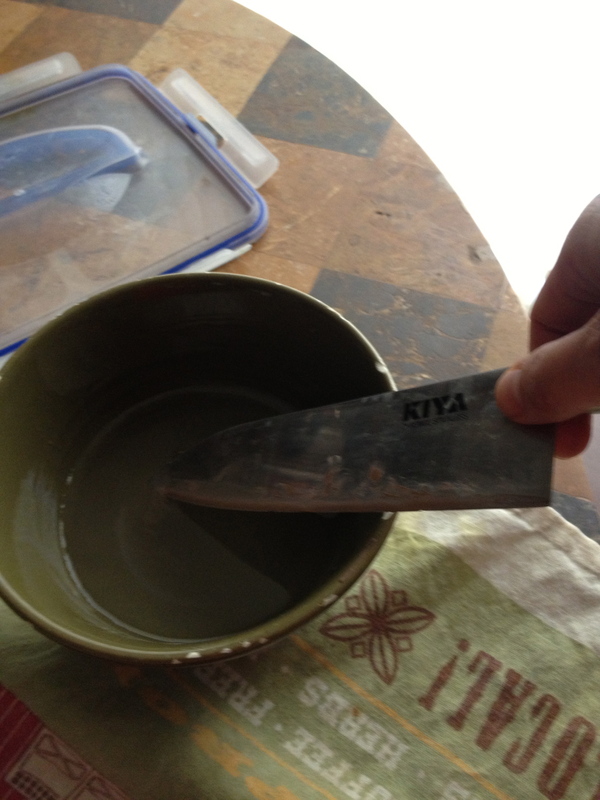 and dip the tip of the blade in the bowl of water and put a few drops on the stone. Then put the blade on the stone about 10-30 degrees perpendicular to the stone. The steeper the angle the longer your edge will last but the more level angles will give you a sharper edge (it just wont last as long). I usually use an angle more in the middle, but its up to you and the knife you have. If the knife comes with recommendations or directions, follow those by all means! You can use an angle guide if you can find one, but otherwise you will need to keep your hands steady so you do not end up with a rounded edge. Wet the stone with the drops of water and drag your knife with pressure from your other hand on the blade (fingers close to the edge of the blade) from blunt end to tip. Drag the blade from the bottom left corner of the stone in an arch to the bottom right corner of the stone. You should end up with the tip of the blade on the bottom right corner of the stone. It is important to keep the knife at the same angle throughout so go slow! For two-sided knives (which most knives are) you will need to do the same for the other side the same amount of times to keep the edge even. Just go from right bottom corner dragging in an arch formation to the bottom let corner. Repeat these steps until you have the desired amount of sharpness to your knife. You can check the sharpness by running your thumb against the blade back and forth (left to right, not up and down!) and if the blade catches on your thumbprint indentations, your knife is sharp. If the blade glides smoothly across your thumb you should sharpen more! Hone your knife after you have finished sort of sets your knife and finishes up your sharpening. Using the same angle, slide the blade down and away from you on the honing steel. Do this on both sides of the blade with the same angle you used for the stone. Now you should have a nicely sharpened knife ready to do your culinary bidding! 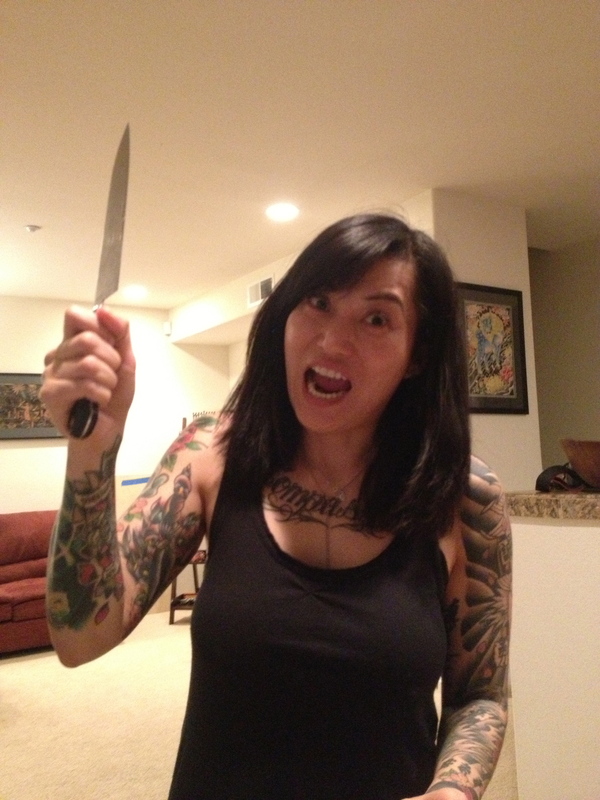 If you have a cooking tip, recipe or food tattoo you would like to share, email us at knivesandneedles@gmail.com! Hi, This blog is very informative and every chef want sharp knife so that the work on a kitchen run smoothly. 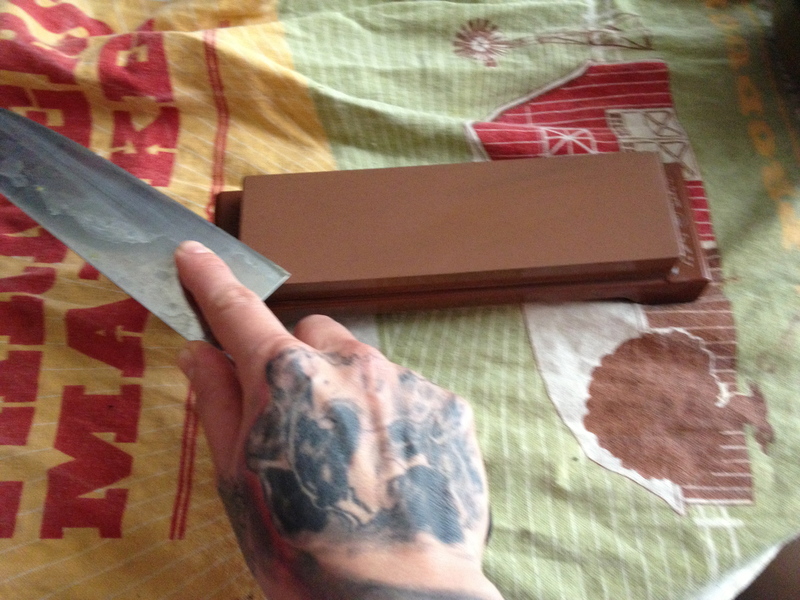 And the method of sharpening a knife is very help full. It is easy to follow this method. Thank you!! I am happy you liked my post!